Our day started with a parade in Accomac. Tucker rode in the stroller and Caroline walked...well, actually she walked until she decided that she didn't want people taking pictures of her and then I had to carry her. 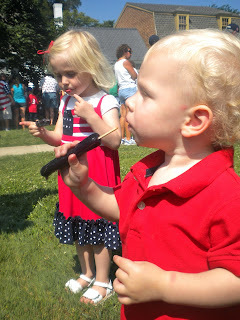 The kids got popsicles at the end of the parade. 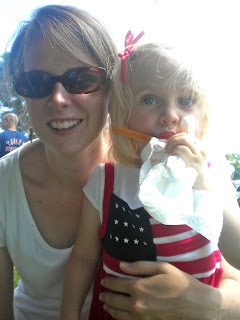 They had never had popsicles like this and they loved every minute of it! 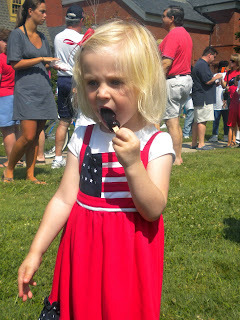 Caroline ate her popsicle very neatly, while Tucker ate the popsicle upside down. This only lasted a few minutes as he soon realized that the stick did not taste all that good. After the parade we went to the beach. The kids played very well together in the sand. Caroline started splashing in the water and got her suit wet. She immediately took it off because she did not want her bathing suit to get wet. She played for several more hours naked. Tucker also joined in the fun and played naked. Birthday suits are the best suits! I love that picture of Tucker with his upside down popsicle. He's adorable! I'm glad you guys are home and safe!